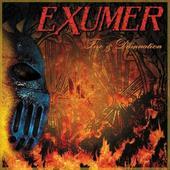 Exumer returns after a 25-year hiatus with the 10-track offering, "Fire and Damnation,." This German-based thrash metal squad makes up for its two decades plus absence from releasing a studio album with a straightforward and unrelenting thrash metal presentation laden with snarling vocals, galloping guitars galore, and a colossal bass and drum crunch (“The Weakest Limb”). No surprises here, just a supply of sturdy songwriting and a steady stream of speedy licks and rhythms that assist Exumer to come back from inactivity with a mighty roar (“Fire and Damnation”) that skillfully blends elements of fellow countrymen Kreator, Sodom, and Destruction with Bay Area notables Exodus (“Devil Chaser”) and Testament. For more information, check out http://www.myspace.com/exumerwakingthefire.